Swiss painter, associated with the German expressionist movement Der Blaue Reiter and later creator of a personal vision of the fears and fantasies of the man of the 20th century. He/She was born in Münchenbuchsee (Switzerland) in 1879, in a family of musicians, and died in Locarno in 1940. The passion for music, which characterized his childhood, will deeply mark his life and his work. Soon he/she becomes a poet and musician well prepared. 1988-1901 studied in Monaco. He/She makes his first trip to Italy, where he/she impresses him the Renaissance tradition. Admire the visionary symbolism of Blake and Goya, as well as the Ensor and Redon, whose work had seen in Paris in 1905. It is established in Berne in 1902. It exposes satirical drawings in the Secession of Monaco (1906), which has a chance to see works by Ensor, Cézanne, Van Gogh and Matisse. In that same year he/she participated in the Munich Secession where become familiar with Impressionist painting, under whose influence he/she begins to work from nature. From 1911 he/she began to record all his works in the Oeuvre Catalogue, containing parts from 1884. In this year he/she met Kandinsky, Marc, Macke, Jawlenvsky, that takes part in important exhibitions, as the second of Der Blaue Reiter. Feels great affinities with the theories on the spiritual essence of the art of Kandinsky and interpretations that Marc makes the animal world. In 1912 visit Paris for the second time and sees works of Picasso and Braque , and met Robert Delaunay , whose series of pictures about windows open you eyes to a new use of color. 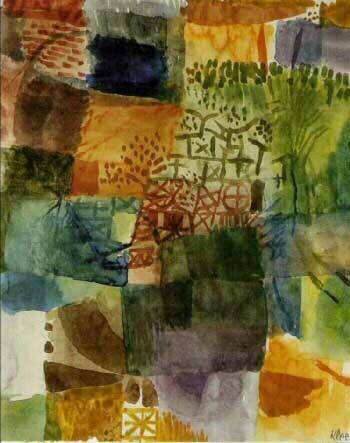 Remembering of a garden (watercolor and paper linen mounted on cardboard, 1914). Kunstsammlung Nordrhein-Westfalen (Dusseldorf, Germany). In 1914 he/she participated in the Foundation of the new Munich Secession and travels to Tunisia with August Macke and Louis Moilliet. The intensity of the color and the light of North Africa, coupled with the influence of Macke, makes that color will become a key element in his art. From this moment is noticeable in his work an influence of Cubism and, in particular, of Delaunay. Between 1914 and 1920 he/she paints landscapes and cities in which constructs a tapestry of rectangles into prismatic colors that recall mosaics. These compositions combine the structure of network of cubism with Expressionism pictorial intensity. The theme of the city and the tower is imbued of mystical associations to a new Jerusalem and carries mythological, literary allusions and symbolists (city of towers, 1916). In his post-war work he/she is interested in the process of creation and movement; they are the topics analyzed later during his teaching time. In 1920, he/she was invited by Walter Gropiusto join the team of the Bauhaus in Weimar, where he/she runs his own course of theory of forms. It remained there as a Professor until 1926 and passed to the Bauhaus in Dessau, where he/she continued teaching until 1941. Throughout this period he/she maintains close contact with other teachers (Kandinsky, Feininger and Moholy-Nagy). In 1925 the Bauhaus published his Pedagogical Sketchbook, where raises his fundamental theories on lines points and planes. His work of these years moves between the geometry of the constructivist way, Cubist structure and the world of the subconscious, although it is only tangentially connected with the surrealists, who admire his work. His teaching is based on a complex theoretical program that exemplifies and explains with his own work. Sometimes he/she studied plants and their growth process and is also interested in architecture. Magic Garden of 1926 it combines buildings and vegetation; his pictorial motives is taken from geometry exercises. "(...)With his teaching provided models not things but of conduct. "He taught that the draughtsman, (...) always projected to life, and he/she has to bear in mind its entirety, with all its layers and levels (...)" (Argan). In 1924 he/she exhibits at the Société Anonyme in New York and in 1930 Exhibition at the Museum of modern art in New York. In 1931 he/she moved to Dusseldolf, whose Academy teaches. Forced by the nazis to leave the Academy, he/she moved to Berne. Major exhibitions of his work in Bern, Basel and Zurich are organized. 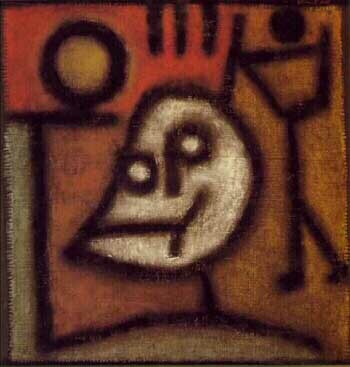 Belonging to this decade Klee's work is marked by a dip in the darkest areas of the inner world. The last stage of his life meant for Klee a highly prolific period, he/she came to compose up to 1,253 works in just a year. They belong to this time Mephisto as Palas (1939), a park late at night (1940) or emblematic death and fire (1940). Death and fire (1940). Foundation Klee (Berne, Switzerland). He died on June 29, 1940 in Muralto-Locarno (Switzerland) because of a Scleroderma. At the end of World War II his work had enormous impact in European art of the years 40 and 50. FLINT, Lucy. The Collezione Peggy Guggenheim. New York, 1983. ARGAN Giulio Carlo, modern art. Valencia: Fernando Torres, 1977. A Biographical Dictionary of Artists. London: Sir Lawrence Gowing Editor, 1994.